On Eve of Controversial Sessions Confirmation Vote, 30 Arrested in NAACP Action in Ala. Hours after a municipal prosecutor in Mobile, Ala., dropped all trespassing charges against the NAACP officials and supporters who occupied the office of U.S. Sen. Jeff Sessions (R-Ala.) earlier this month, a group of protesters occupied his office again Monday in advance of Tuesday’s controversial vote to confirm him as U.S. attorney general. Monday’s planned action included a march and rally at which demonstrators planned to ask Sessions to withdraw his name from consideration for attorney general, Local 15 reports. This Monday, Jan. 30, the NAACP will march in Mobile, Ala., to the office of Sen. Jefferson Beauregard Sessions III, and ask him to withdraw his name from nomination for the U.S. attorney general. During his Senate confirmation hearing, Sessions claimed that he’ll protect all Americans’ rights. But his assurances couldn’t erase the decades of his actions. As attorney general, Sessions could undo years of progress. He could crack down on immigration, stop investigating police brutality, revoke the current DOJ policy letting states legalize marijuana, roll back the DOJ’s enforcement of civil rights—and actively punish the people that civil rights laws and the DOJ are meant to protect: women, people of color, LGBTQ people, Muslims and immigrants. 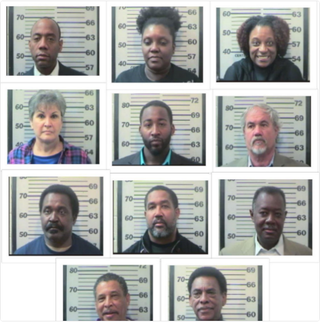 The NAACP later tweeted that 30 people, including Bernard Simelton, president of the Alabama state chapter of the NAACP, and Cornell W. Brooks, president and CEO of the NAACP, were arrested and charged with trespassing. The NAACP is encouraging those who want to help stop Sessions from becoming attorney general to call their senators. Read more at Local 15.